Its lovely details like plinth blocks, door trims, baseboards and even corbels that add height, interest and a whole lot extra to your doors and windows. These little features can do so much to add character, but also unify different living spaces. This post is focusing on plinth blocks, trim and corbels for above, below and between doors, windows and rooms. Using them through out your home can be a big, expensive project, but you can get similar effects by using them in parts of your home as features to keep the costs in check. When it comes to perfecting your home decor, details count. 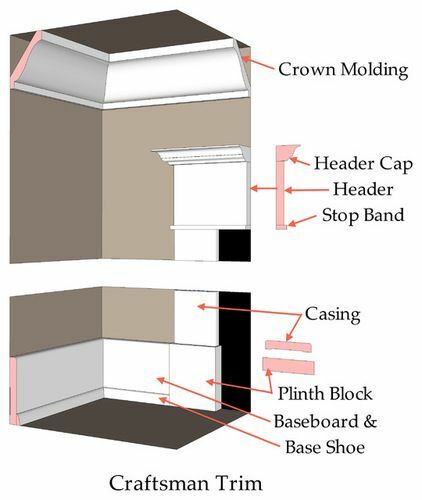 Replacing window trim or adding features like plinth blocks, installing door trim or corbels define spaces, and distinguishes them, in keeping with your architecture, from craftsman, modern to Georgian, Colonial or Victorian. Most modern homes built in the last 20 years have flatter walls, so the base board sits flush with the wall. In this case plinths are rarely used. Even though they are not a necessity, you might decide to add plinth blocks, door trims, or use a single corbel to create features. This video shows how the clever use of very simple trims can really enhance the look of your home and add character where none previously existed. Older homes have fewer flush walls, causing misalignment with baseboards and walls. 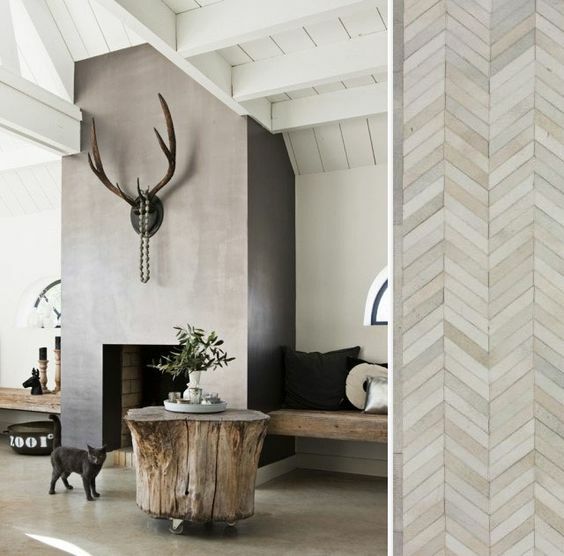 Plinth blocks and larger baseboards can hide these variations, adding character as well as being functional. Helps achieve a more traditional look. Plinth blocks are a good solution for complex joinery and save time. Plinths are a good solution for creating a more elegant, seamless look over old, existing plinths and baseboards. You can use plinth blocks on all your door surrounds or limit them to public living spaces, like your dining room, living room, hallway and kitchen. 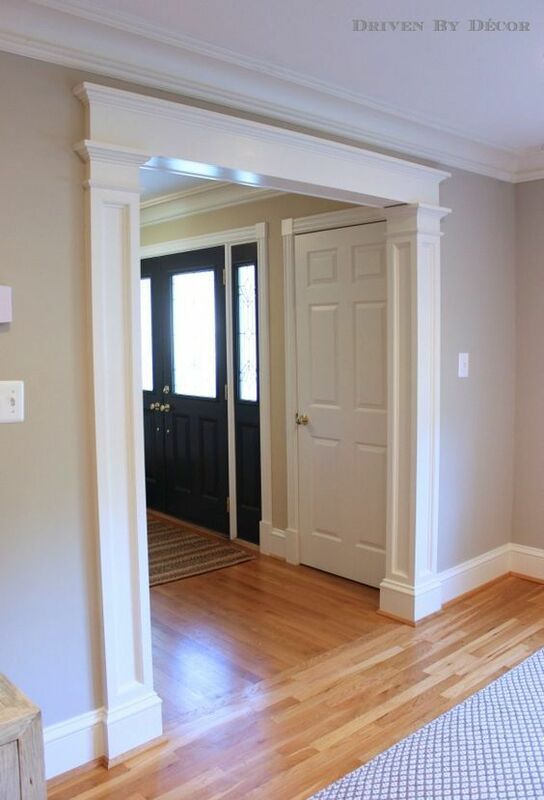 Adding new doors to older homes is a challenge when it comes to installing door trim. 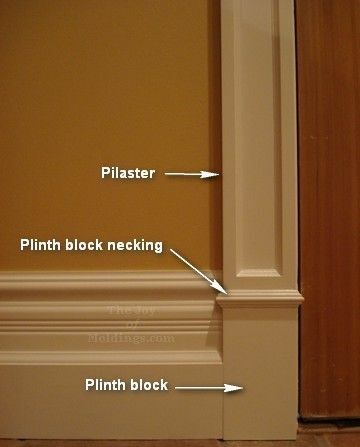 Adding a plinth block can be the perfect solution to cover any irregularities of the past, and change the look of your baseboards and door casings. Here are the different elements for your door trim. Remember, you don't need to use all of them. You can design your door trim to be fancy, or simple, in keeping with the style of your home or something completely different. Do you need all these elements? No, you can keep it very simple, and still keep an elegant look. Door trim and window trim design and creation are similar. 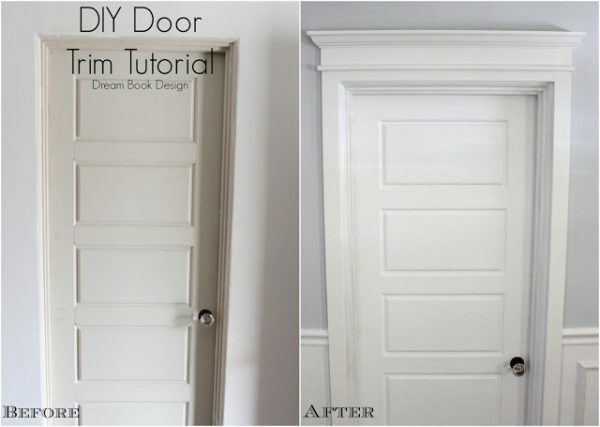 If you need a tutorial, go no further than this informative DIY door trim tutorial from Dream Book Design. 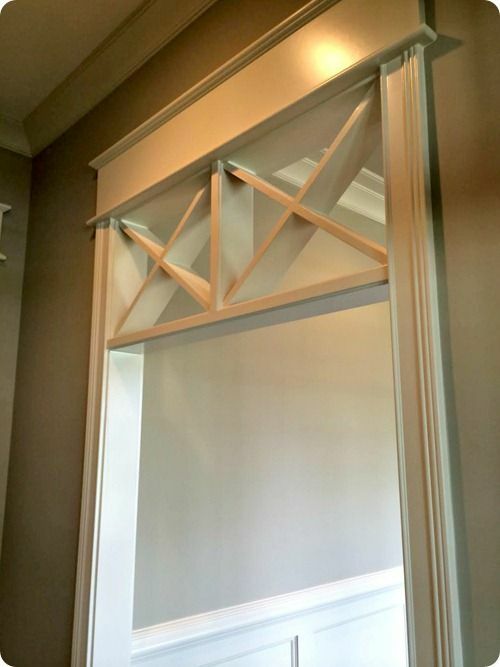 If you want more natural light to flow into the inner rooms and hallways, one way is to add a transom. 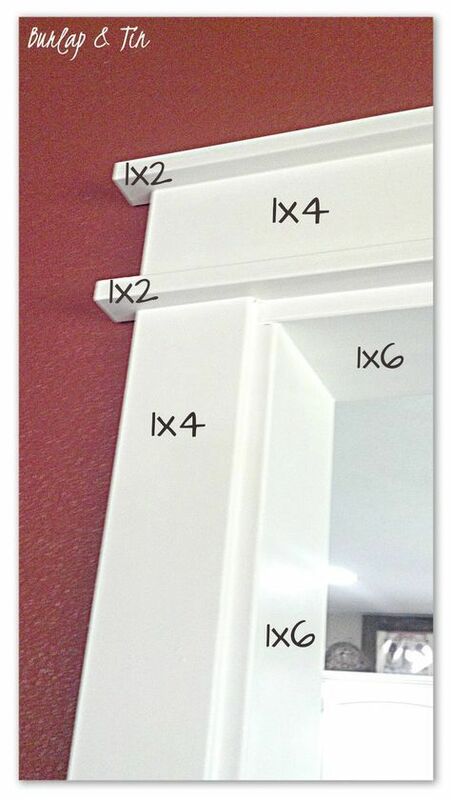 Here is a DIY transom tutorial from Thrifty Decor Chic to help you get this classic look. What if you are reducing your walls and doors, and creating more open spaces? Throwing down walls of old homes comes with the challenge of disguising supports, so they don't look out-of-place, and adding corbels can be a defining feature that harmoniously joins all sides of the space together. 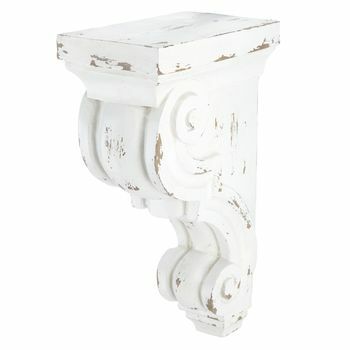 Use them on columns, fireplaces, kitchen islands or as decorative trim on tables etc. 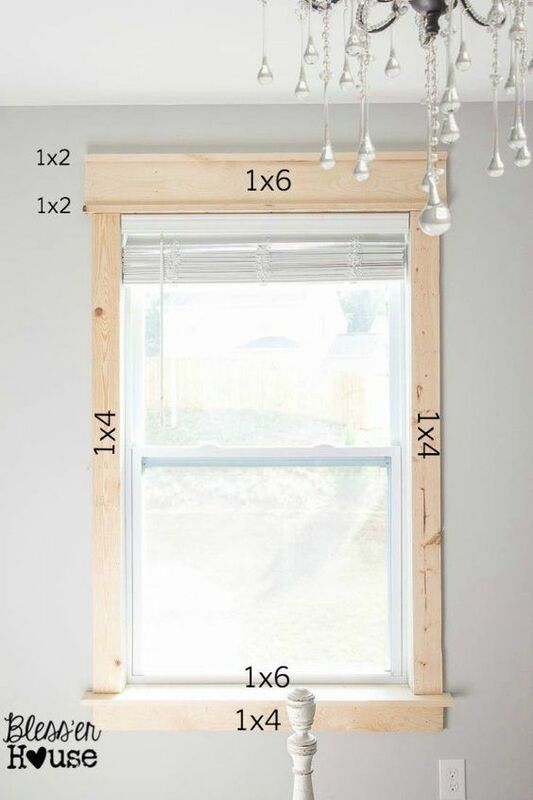 There are so many different window trim designs. They are an instant feature that can change the look of any featureless room instantly. The one below is from Blesser House. Its DIY and quite easy, if you have the right tools. Windows and doors are not the only places you can add trim. To modernize a fireplace stuck in a time capsule, you can drywall the brick, add tiles, custom millwork, a character filled mantel, custom cabinets and shelving to surround fireplace. Each layer of detail adds more features and character to your room, making it feel cozier, lived in and loved. Here a modern farmhouse fireplace, equally dramatic and stylish, uses the fireplace as one large plinth block. 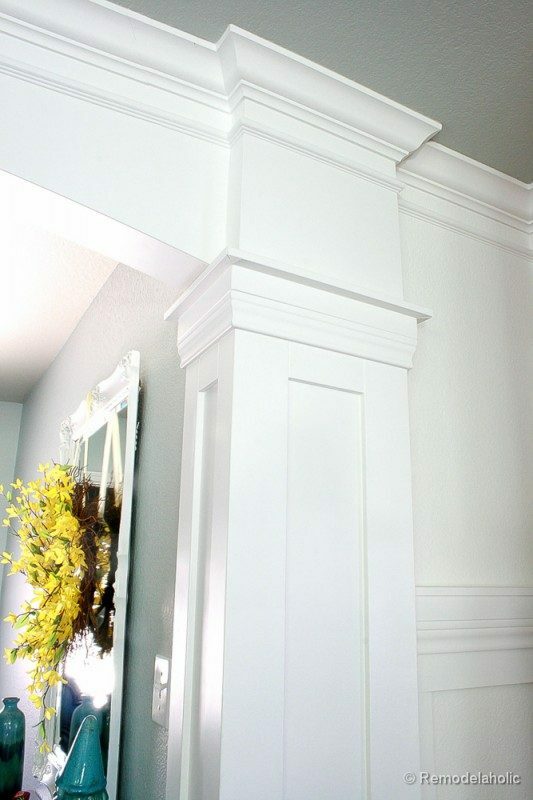 Another elegant column design, plus a tutorial from Remodelaholic. 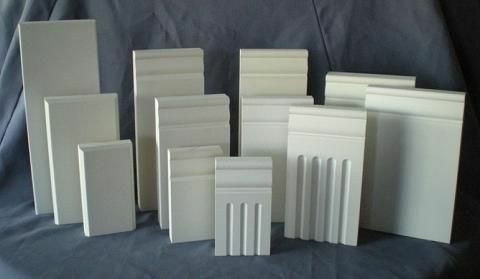 These are just some of the decorative trim styles and designs you can create using plinth blocks, trim and corbels. How will use them? saved to my pinterest for my new home build next year!! THANK YOU for all your help and how-to,s !! so this old woman doesn,t feel like an idiot trying to talk to contractors! now I can SHOW them what I want!!!!!!!! especially thank you for linking us to Pinterest! You are so welcome Peggie! Happy to help out!